I'm still reading up on the candidates and propositions. It's not easy finding information that I can easily understand. Here are some links for local and state items that I've found useful. Maybe they'll come in handy for you, too. Remember, voting day is Tuesday, November 6. You can view videotapes of mayoral candidates and a few other local candidates at Community Media Access Partnership (CMAP). Here's the link. On 10/16 and 10/17 the Farm Bureau hosted a candidate forum. On Channel 17, you can watch the videotape of the two nights. You can find the schedule for its showing at this CMAP link. 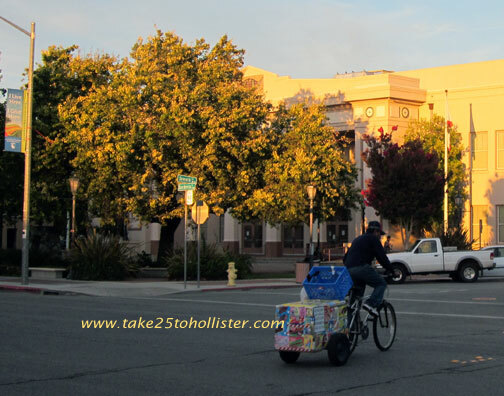 San Benito County Today is the Web site for the Hollister Free Lance. By registering (it's free), you can read articles about candidates and Measure E, as well as opinion pieces by the candidates and their supporters (or not supporters). Here are three sites where you can get information about the state propositions. Others say San Benito High School. In my day, it was San Benito Joint Union High School. Quite a mouthful, yep. Yesterday afternoon was the Homecoming Parade. I don't recall the last time I saw one. Most likely my senior year. I have to say, I almost felt like crying. It must come with being older. 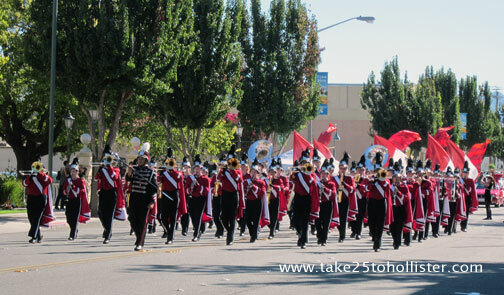 For more photos, check out the Homecoming Parade album at Take 25 to Hollister Facebook page. The moon was in its Waxing Gibbous phase on Tuesday (October 23). 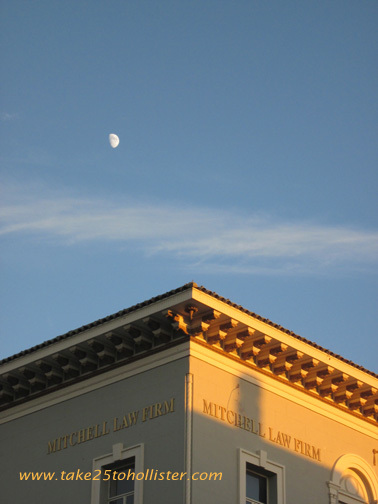 Of course, you know what building you're looking at and on what downtown street corner it stands. Sure you do. Here's another view of San Benito Street as the sun set that day. No doubt it was a long, hard day for the bicycle food vendor. Hopefully, it was a good day of sales for him. 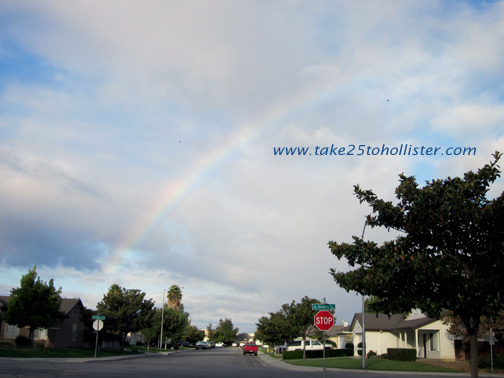 As the Husband and I were walking this morning, we spied "half" a rainbow. It was about to melt into the light of the day. "I wonder where it's raining," said the Husband. Ten minutes later, we heard what sounded like thunder, or, as the Husband put it, someone dropping some wooden planks. It had to be a humongous giant then with very, very thick slabs of wood. But, looking ahead, we could see the clouds crying rain over the mountains that kept Cienega Valley within. 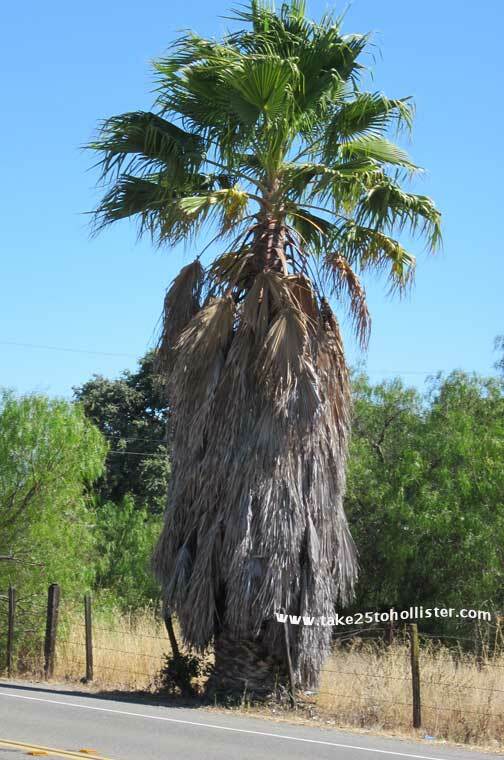 There's this tree along Highway 25 in the hamlet of Tres Pinos that always makes me think of Hawaii. If I look at the tree from certain spots, I'm reminded of the ancient Hawaiian kings sporting their amazing helmets and feather capes. And, from other viewpoints, I can almost believe that beyond that tree is the ocean. As you're heading south (towards Tres Pinos) on Highway 25, look ahead for the pink house on the right, just before you get to Union Road. There's a driveway a bit beyond the house that will lead you down to a longtime local farm stand known as Bertuccio's Market, aka The Farm. Another landmark to tell you where the driveway is this old truck. 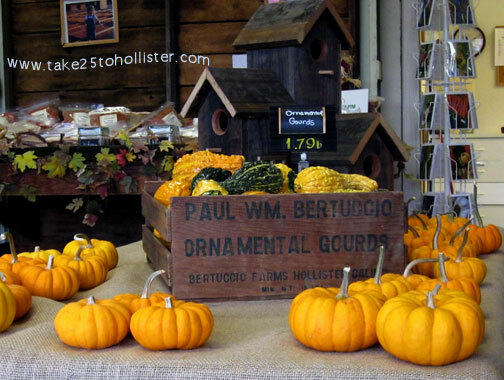 The Farm is a good source to buy fresh local eggs and milk, as well as fresh veggies and gourmet olive oils, pickled veggies, jams, pasta, and such.The Farm features their own goods as well as products made by local agriculturists and food companies. Check out these links to learn more about Bertuccio's. Note to FCC: Nobody paid me or gave me free samples to write about this establishment. That's right! I like to imagine that the black bird, possibly a crow, sitting on the lamp post on Meridian Street was enjoying the sight of the rising moon. I wonder if birds ever dream about one day going there. Two Sundays ago, after a hot day of hiking up and down the deAnza Trail in San Juan Bautista, the Husband and I longed for an ice cold beer. 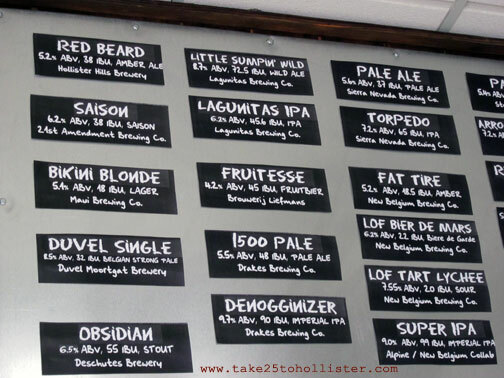 But, we weren't in the mood for going to one of the bars in San Juan or to either of the two beer pubs in Hollister. Nor were we interested in going to the market to buy a six-pack. Yeah, I know, picky, picky. 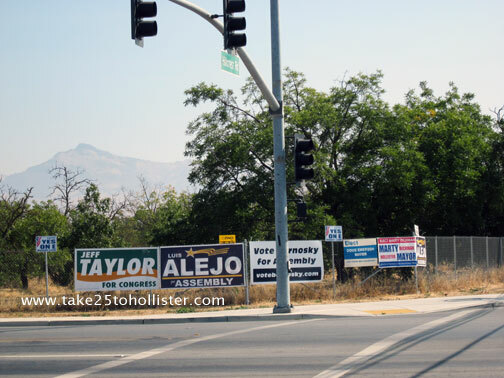 As we drove back to Hollister, the Husband suddenly said, "Maybe the new brewery is open." So, we swung by. And, wouldn't you know it. Open! The brewery is owned by two couples—Sean and Fran, and Chuck and JoAnn (who own Relax! Grillin & Chillin). We met Sean, Chuck, and JoAnn. Very cool people. Sean gave us a tour of their nanobrewery. Yes, that's what he called the small room where they do their magic. They only brew small amounts of a beer at a time. They started brewing beer a few years ago. We thought they had been doing it much longer because of the passionate and joyous vibes that Sean gave out as he spoke about all that goes into crafting beer, including the choice of hops and other ingredients. I should've taken notes, but by then I was already "happy" from sipping the Red Beard so my notes wouldn't have made sense later on anyway. Hollister Hills serves non-alcoholic beverages (their own brewed root beer, for example) and artisan fare. They try to use fresh, local ingredients. What I like is the choice of ordering full or half portions of a sandwich, which comes with a side of macaroni, potato, or green salad. We tried the Rueben and the French Pig—prosciutto, brie, and apple slices on ciabatta. The potato salad was yummy, but the macaroni salad reminded us of Hawaii. Yep, that tasty. 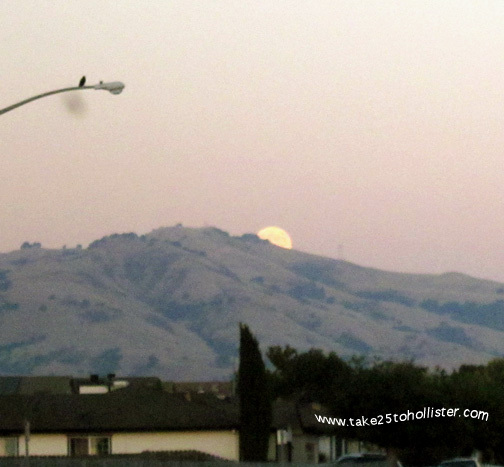 Hollister Hills is open daily. Monday to Friday, 11a.m. to 10 p.m. and Saturday/Sunday, 10 a.m. to 10 p.m. It's located in the Clock Tower Plaza on McCray Street. It's next to Subway Sandwiches and kitty corner from the pet store. Its exact address is 401 McCray Street, Suite B24. Click here to visit its Web site, and here to visit its Facebook page. Note to FCC: Nobody paid me or gave me free samples to write about this establishment. So, there.